1. How do I type in commands rather than use the desktop? The username, hostname and current directory is displayed followed by a flashing block cursor. To exit this window, type exit or click on the X on top right of the window. 2. What commands are available to use with Linux? Commands can be run from the current directory or those listed in the command path. The command path can be viewed by typing Path and can be edited via the System Control Panel, Advanced, Environmental Variables. Most commands are available in the C:\Windows\System32 folder. To view the parameters of the command you can type either Help <command> or <command> /? (slash, question mark). Commands can be combined using the pipe (|) character e.g. Type file | More. bash Start a new bash session. cd <directory> Change directory. Root directory is '\'. chown Change owner of file. 3. How do I change the colours for the command prompt? Open a command window, select the Edit menu and then Profile Preferences. Select Colours tab and untick 'Use colours from system theme' and then you can change text and background colours. You can modify the .bashrc file in your home folder, and uncomment the line force_color_prompt=yes which will modify the PS1 environment variable to colorise the command prompt. 4. How do I change the command prompt text? By default, the command prompt is the user, profile and current path followed by an $ e.g. user$host ~ $ which is set by the command $PS1 = "string". For example, current user is /u, current host is /h, current path is /w, current shell name is/s. 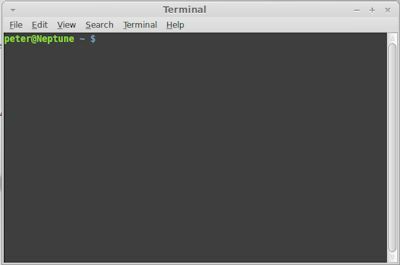 For a complete list see Bash Prompt strings. 5. Where do I change bash start script settings? In bash each user can have a .bashrc file in their home folder which contains startup scripts to configure their personal bash shell such as the prompt string, command aliases, set environment variables (.bash_profile) and so on. Type ls -la in your home directory to view these files. 6. How do I view the history of commands? The history command will display a list of commands you have last used in the current and previous sessions. They are also stored in the .bash_history file in your profile.Use the up and down arrow keys to recall the last or next command used in your history. Use the tab key for auto-completion of filenames to save typing. 7. Some commands use regular expressions. What are they? Normally you can use the standard wildcard characters such as * (match any character) and ? (a single character). But you might want more finer or advanced control on strings, so you must learn regular expressions e.g. ^*\.txt$ . See tutorial on learning regular expressions.